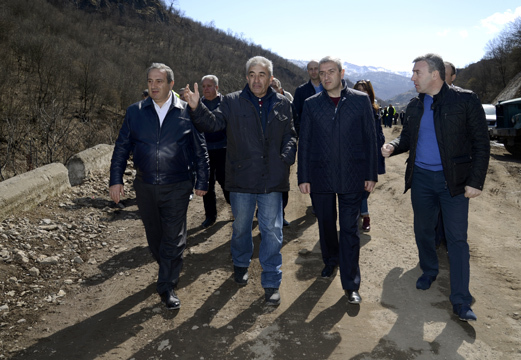 Mr. Vahan Martirosyan, Minister of Transport, Communication and Information Technologies of Armenia, visited the Lori region, where the rehabilitation and improvement project of the M6: Vanadzor-Alaverdi-Georgian border interstate motorway has been underway since last year. The first part of the project is financed by the European Investment Bank. The construction works include the 38 km section of the interstate motorway. The Minister made stops at different sections, heard out the concerns of the road-constructors and the problems encountered during the work. At the starting point of the road under renovation, where the “Ararat-chanshin” Company operates, the works on exploding, molding the rock soils, as well as the extraction and padding ground works in soft soils continue. Presently the works on moving the existing infrastructures, demolition of the soil cover, installation of the artificial structures and construction of the abutments are ongoing. The Director of the Company assured that the construction is moving on in line with the schedule determined by the Project. A problematic matter was introduced to the Minister: there are old and overused tubes of the hydroelectric power station below the road section under renovation, which was not known at the design stage. After the discussion on site and following the advice of the specialists mr. Vahan Martirosyan instructed to dismantle them in order to avoid further complications and the disruption to the foundation strength. The Director of the “Chanaparh” Company introduced another frequently encountered issue: the realization of the privatized lands. Mr. Vahan Martirosyan instructed the Head of the “Transport Programs Implementation Organization” SNCO under the Ministry to have discussions with each land-owner and find a mutually beneficial solution. The 2 tunnels on the interstate road under renovation are undergoing rehabilitation and the third is being fully reconstructed. The civil works in the tunnel haven’t stopped since Minister’s visit last November; concrete cover works have been completed. The correspondence of the tunnel width and height to the required criteria by the construction norms is ensured. 3 tunnels out of the 12 on the road will be demolished to the ground and rebuilt; the other 9 will be rehabilitated. The representatives assigned by the European Investment Bank to supervise the construction works are watching out for the Project correspondence and compliance with the safety norms throughout the entire process of the road renovation.